Trivia Night is this week - watch your inboxes for information on how we can make this an amazing Fundraiser for MMS. Bring cash for Mulligans. If you didn’t remember to get your tickets, look for the other ways to participate in community involvement. Special shout out to Special Projects Chair – Tracey Clarke, for putting together the video on Library Media Center. We could use anytime you have to support this initiative. Thanks to the entire MMS community for your continued and valuable support!! Trivia Night has sold out! Thank you to all the amazing families and staff who signed up to attend. If you didn’t buy your tickets in time, we hope you will look for other ways to support the HSA. Interested in helping with the event? The organizers could use your help with set-up and clean-up! Click here. MMS/SOMS 8th Grade Mixer: Attention all 8th graders! This Thursday, February 1st from 7 PM to 9 PM in the CHS cafeteria there is an 8th grade mixer with both MMS and SOMS students. You won't want to miss it! DJ, dancing, photo booth, snacks, and prizes. Show up with your friends and make some new ones! - Permission slips went home this weekend or you can click here and print. - A signed permission slip + $5 is your ticket to the event. Hand in the slip and the money to an HSA volunteer during 8th grade lunch this Tuesday 1/30, Wednesday 1/31, or Thursday 2/1. Tickets will not be sold at the door Thursday night. - We need help to make this event a success! Please click here to see the Sign Up Genius to donate some items, funds, or your time. Tickets are on sale now – don’t miss out. Click here to buy! Questions on all things MMS Musical – please visit the Musical Website. Click here! The Achieve Foundation awarded more than $64,000 to teachers for grants this year! Because Achieve receives so many extraordinary proposals, some grants are partially funded. Now you can contribute to these eligible projects through Achieve’s Direct Grant Funding campaign. Please consider donating DIRECTLY to one or more of these MMS projects of your choice. Spotlight on Ms. Reisman’s Expresssion Through Woodworking… See this article. So amazing! Please click HERE to donate to the teachers at MMS. (Please note: The amounts represent the total needed to fully fund the grant proposals. Staff members can begin implementing their programs with partial funding. Any and all donations will be appreciated and are fully tax-deductible)! For a list of all of the Achieve grants awarded this year, please click HERE. Thank you! MMS will host its first-ever Spring Fair this year in conjunction with the South Mountain YMCA. It promises to be a great day of fun for our MMS community! Go No Frills OR Host an MMS Money Maker! You choose how you want to raise the money and how it will be spent! Please reach out to Fundraising Co Chairs Mel Rose melrosenj@gmail.com or Gabrielle Graziano at gabriellept@aol.com. They can also help you come up with great Fundraising ideas. It appears we have a full week of school ahead for the students at MMS and two concerts. Amazingly, our MMS Trivia Night is Sold Out, so use this as a lesson and please don’t miss the opportunity to see our amazing musical show! There are still tickets available. As always, your financial support of the MMS HSA is also appreciated. We are just half way to our $12k No Frills Fundraising Goal, there is still time to contribute to MMS. Click here to donate or send a check (made out to MMS HSA) or cash via your child’s backpack to: MMS HSA Treasurer Mary Ellen Dawkins. This week our orchestra and band students perform at MMS. Orchestra performs Tuesday, 1/23, and Band Wednesday, 1/24. Both concerts begin promptly at 7 PM. If your student is performing and you need more details, see below for information from the teacher. Your MMS HSA will be collecting donations for the Fine Arts department, please bring $$ if you can. Suggested donation $5, but we will take more! Trivia Night has sold out! Thank you to all the amazing families and staff who signed up to attend. If you didn’t buy your tickets in time, we hope you will look for other ways to support the HSA. Interested in helping with the event? The organizers could use your help with set-up and clean-up! Click here to Sign up. Attention 8th grade families: Our MMS/SOMS 8th grade mixer is coming up! The event is Thursday, February 1st from 7 PM to 9 PM in the CHS cafeteria. Your kids will be bringing home permission slips, or click HERE to print at home. HSA volunteers will be collecting permission slips + $5 cash during 8th grade lunch on 1/30, 1/31, and 2/1. Please encourage your kids to show up! This mixer is a tradition between the two middle schools and is always extremely well-attended. It's going to be a lot of fun, with a DJ, dancing, photo booth, snacks, and prizes. But we need your help to make it all happen! Please see this Sign Up Genius HERE to contribute items, your time, or funds to the event. Thank you! Tickets are on sale now – don’t miss out. Click here to buy Tickets. Tuesday, January 23rd, 7:30-9 pm at BOE building, 525 Academy, Maplewood. Hear from our school liaisons and SPED PTO executive board members about their personal experiences and share your own with others who can relate and have similar questions and concerns. Special guest will outline the transition from PreK to Kindergarten. Outstanding opportunity to network with other parents. ALL ARE WELCOME! Meeting will include an update by SEPAC on their recent advocacy efforts on behalf of the Special Education community. MMS has begun a partnership with the township to connect our students to seniors in the community. This might include spending time with them, helping them learn a bit about technology, or helping with tasks around their homes. Parent/guardian permission will be required and students will only be permitted to go in groups of 3-4. More information is forthcoming. Please visit the ​website to Buy Your Tickets Now! Congratulations and thank you to the students and staff of MMS for the thoughtful and moving Silent March through Maplewood Village in honor of Martin Luther King Jr. Day. It was truly an exceptional experience to behold. Thanks also to the MMS Select Chorus for their incredibly moving and inspiring performance of “We Shall Overcome.” It was an amazing day for students and staff alike. 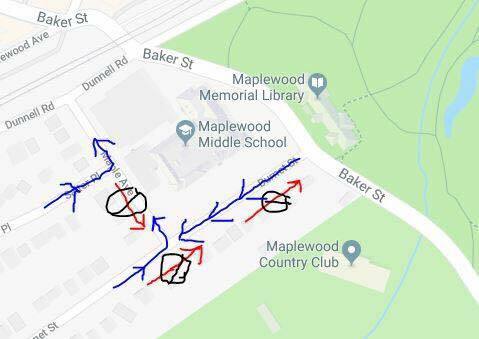 A reminder that if you plan to drive your students, please remember the traffic flow patterns around the school have changed. There are also a few reminders below to hopefully help you ease back into all things MMS. ORDER NOW! SPIRIT-WEAR Online Store OPEN for 2018! SAVE THE DATE! Over half of our tickets are sold so please order your tickets if you’d like to join in the fun! Please mark your calendars and plan to join in the fun for our biggest fundraiser of the year! Do you know which country allowed women to vote first? How about which finger nail grows the fastest? If you know the answers, or even if you don't, COME HAVE FUN at trivia night. Donate your dollars to MMS and show off your most trivial assets. Teams of ten compete for tacky statues and bragging rights. No team? No problem! We will find a team for you. *Advanced ticket sales are currently open to cast, crew and staff members. 2) Volunteers to feed our Saturday Volunteers & Crews on Saturdays in January and February (noon) - pizza and cases of water are greatly appreciated! **Interested volunteers for #1 or #2 can contact Mr. Palmgren (rpalmgre@somsd.k12.nj.us)! 3) Donations of prom dresses, ball gowns, artificial Christmas trees. 1) Questions about remaining January rehearsals? Please find on the MMS Musical Website to review the rehearsal calendar. 2) We hope you took advantage of your opportunity to pre-order tickets and add ons! If not, please visit the MMS Musical Website for both electronic versions and paper copies. 3) Interested in an advertisement for the playbill? The due date is this Tuesday, 1/16! Visit the MMS Musical Website and print out AD JOURNAL FORM and send with attention to Ms. Bradshaw. 4) During February we rehearse ALL week, including Tuesdays! This year with an incredibly shortened tech week is it more important than ever that cast members plan to attend every rehearsal in February. 5) In order to make full cast rehearsals more comfortable, we move students into classrooms and ask that parents chaperone during those times. Can you help chaperone? Please visit the Sign Up Genius and help make our February rehearsals comfortable and productive. Please contact Ms. O'Sullivan (mosulliv@somsd.k12.nj.us) for more information. On Friday and Saturday night, following the performances, cast/crew and friends and family are invited to the cafeteria to celebrate the success of the show. Each cast/crew member is required to donate at least one dessert on Friday night to contribute towards feeding the cast/crew and their families some snacks. Each year dessert party coordinators organize the decoration and cleanup of the cafeteria both pre and post show, purchasing cups and napkins to accompany the post-show snacks, organizing the large jugs of water and/or juice, and adding any special touches that generally blow everyone away! Please contact Ms. O'Sullivan (mosulliv@somsd.k12.nj.us) with your interest in Dessert Party Coordinating. For all three performances concessions are sold during intermission. The concessions coordinators organize the purchase and transportation/delivery of bulk candy, snacks and water as well as price and organize the sale of concessions for all three performances. Concessions Coordinators also work with the Ms. O'Sullivan to organize and craft the CandyGrams that are delivered during each performance. Please contact Ms. O'Sullivan (mosulliv@somsd.k12.nj.us) with your interest in Concession Coordinating. The Achieve Foundation awarded more than $64,000 to teachers for grants this year! Click here to read about a special project featured at MMS! Please click HERE for more information about each grant and to donate online today! For a list of all of the Achieve grants awarded this year, please click HERE. Thank you! Ms. Felder is looking for more members of the Math Counts club! The Club has students of all ability levels that have an interest in problem solving. The Math Counts Club will be entering national contests for prizes. Please contact Ms. Felder at: jfelder@somsd.k12.nj.us to join or for more information! Seems like we will actually get a full week of school in starting tomorrow and that temperatures are going to get to a more normal range, thankfully! SAVE THE DATE! Please mark your calendars and plan to join in the fun for our biggest fundraiser of the year! Do you know which country allowed women to vote first? How about which finger nail grows the fastest? If you know the answers, or even if you don't, COME HAVE FUN at trivia night. Donate your dollars to MMS–a school in great need of your dollars–and show off your most trivial assets. Teams of ten compete for tacky statues and bragging rights. No team? No problem! We will find a team for you. *Advanced ticket sales are currently open to cast, crew and staff members. Public ticket sales will start on January 8th. Even though MMS received a generous number of fully-funded Achieve grants this year, there are still some teachers who only received partial funding. Below please find a list of our teachers who are still looking for full funding for their projects. You can help support the MMS projects of your choice through Achieve's Direct Grant Funding campaign. For a list of all of the Achieve grants awarded this year (including those of the teachers listed above), please click HERE. To donate, please click here for more information about each grant and to make your tax-deductible donation online. The Library Media Center needs parent volunteers to check out, stack books, and help students print out documents through-out the day. Feel free to contact Tracey Clarke (HSA Special Projects) with any questions: tlclarke226@gmail.com or check out the signup HERE. As always, your financial support of the MMS HSA is also appreciated. We are just half way to our $12k No Frills Fundraising Goal, there is still time to contribute to MMS. Click here to donate, it is that simple. Or send in a check or cash, we will take it! Or host a MMS Money Maker: you choose how you want to raise the money and how it will be spent! Please reach out to Fundraising Co Chairs Mel Rose melrosenj@gmail.com or Gabrielle Graziano at gabriellept@aol.com. They can also help you come up with great Fundraising ideas. BRRRR, it sure is cold outside. We hope you had a wonderful and safe holiday break. As we come back to school this week, it looks like the artic breeze will continue. If you plan to drive your students, please remember the traffic flow patterns around the school have changed. There are also a few reminders below to hopefully help you ease back into all things MMS. As always, your financial support of the MMS HSA is also appreciated. We are just half way to our $12k No Frills Fundraising Goal, there is still time to contribute to MMS. Click here to donate, it is that simple. Or send in a check or cash, we will take it! WINTER YOUTH NET REGISTRATION IS OPEN! The Winter Youth Net flyer is out and registration is open through this week. Don’t miss out, there are lots of great NEW offerings! Clubs will begin the second week in Jan. Click here for details. You asked and we listened! The Maplewood Spirit Wear Store reopens for 2018. All orders are custom,click here for details. Musical Website for families involved click here. The Library Media Center needs parent volunteers to check out, stack books, and help students print out documents through-out the day. Feel free to contact Tracey Clarke (HSA Special Projects) with any questions: Please email Tracey: tlclarke226@gmail.com or check out the signup. SAVE THE DATE! Please mark your calendars and plan to join in the fun for our biggest fundraiser of the year! February 2, 2018 at The Woodland. Come and show off your knowledge of pointless useless information. There will be fabulous food and you are welcome to bring whatever your drink of choice will be for the evening. Keep your eyes peeled for when ticket sales begin. Tickets always go fast, the Woodland has limited capacity and you don't want to be left out in the cold. Question: What is celebrated on February 2nd and has been since 1887? Please don't be fooled...the questions for Trivia Night are always much more challenging than this one. Who will be the host of the next Money Maker? It could be you! You get to choose where your fundraising efforts get utilized. To learn more, or to volunteer to host an event, please reach out to Fundraising Co Chairs Mel Rose melrosenj@gmail.com or Gabrielle Graziano gabriellept@aol.com. They can also help you come up with great Fundraising ideas. This easy way to contribute to your school is still available. There is no expiration on this fundraiser. Not interested in throwing a party, or attending one? Click here to donate, it is that simple. Or send in a check or cash, we will take it!